Lee Bul, Untitled (Mekamelencolia - Velvet #6 DDRG10NB), 2018. Human hair, mother of pearl, acrylic, dried flower, and ink on silk velvet, diptych, 57.09 x 81.69 x 4.13 inches 145 x 207.5 x 10.5 cm LM28889 Courtesy Studio Lee Bul and Lehmann Maupin, New York, Hong Kong, and Seoul. Installation view, Hauser & Wirth at Taipei Dangdai. Photo: JJYPHOTO. Courtesy of Hauser & Wirth. 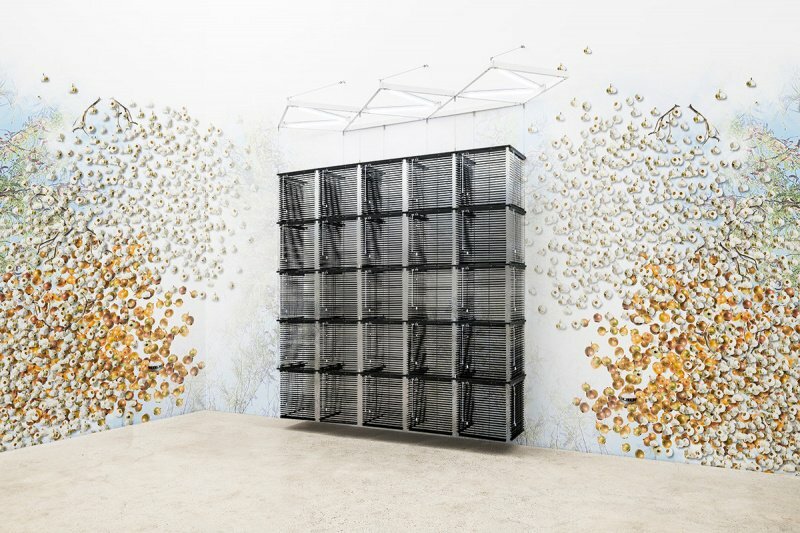 Haegue Yang, Sol LeWitt Upside Down onto Wall – Cubic-Modular Wall Structure, Black, Expanded 11 Times, 2018. Aluminum venetian blinds, powder-coated aluminum hanging structure, steel wire rope, LED tubes, cable, 305 x 304 x 104 cm. Lee Bul, Untitled (Mekamelencolia – Velvet #6 DDRG10NB), 2018. 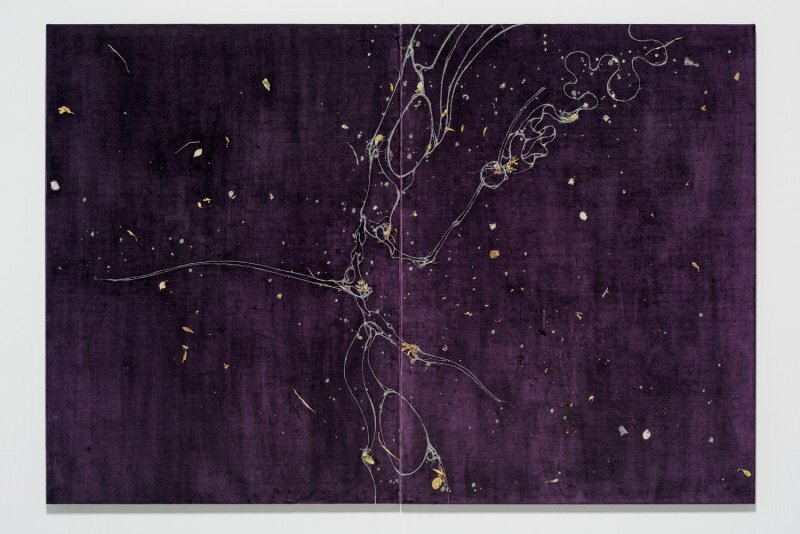 Human hair, mother of pearl, acrylic, dried flower, and ink on silk velvet, diptych, 57.09 x 81.69 x 4.13 inches, 145 x 207.5 x 10.5 cm. Courtesy of Studio Lee Bul and Lehmann Maupin, New York, Hong Kong, and Seoul. Installation View of Chou Yu-Cheng’s work in Edouard Malingue Gallery’s booth at Taipei Dangdai. Chen Wan-Jen, Deep Royal Blue, 2017. Courtesy of Double Square. Isabelle Kuo (郭怡孜) 大學主修生物化學，卻不務正業一頭栽進藝術史的世界。曾是藝術雜誌編輯、藝廊工作人員，現為自由撰稿者。 Trained in Biochemistry but later went astray into the fascinating field of Art History, Used to be an editor and work for galleries, Isabelle is now a freelancer. 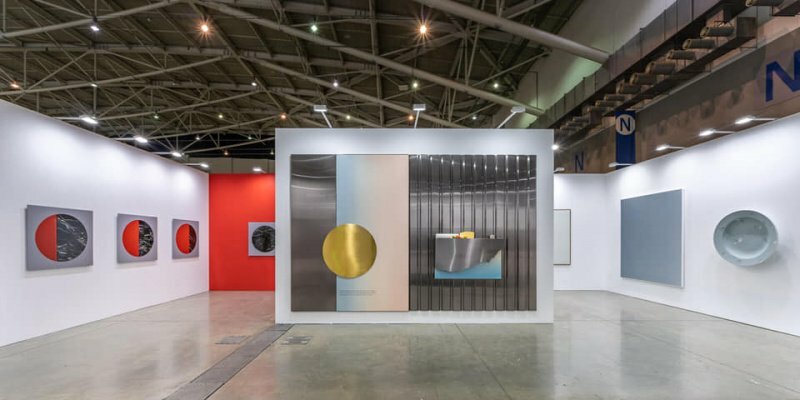 The Asian art scene was energised right at the beginning of 2019, with the inaugural edition of Taipei Dangdai, held in Taipei Nangang Exhibition Center, from 17 to 20 January. Taipei was electrified by the fair and the many parties and events throughout the week, including 20 local gallery receptions on 16 January. There were large attendances right from the beginning, with crowds of largely Asia-based VIPs waiting outside the doors for the preview to open, including those from Taiwan. “Magnus and his team are very professional, the work they have done to bring collectors here is very impressive,” said Sadie Coles, founder of Sadie Coles HQ, who was showing for the first time in Taiwan. “Apart from Taiwanese collectors, some of whom are known to us, most of them are not. There are also collectors from Japan. That’s an area that we don’t necessarily reach all the time in the other fairs… The local scene is refreshingly young. There are lots of young people who are interested in art. To me, that’s very promising.” The gallery found new homes for works by Laura Owens, Ryan Sullivan and the young American artist Michele Abeles on the first day. Professionals from Asia and other parts of the world, including Dr. Eugene Tan, Director of the National Art Gallery in Singapore; Yoshiko Mori, Chief Director and Fumio Nanjo, Director of the Mori Art Museum in Tokyo; Doryun Chong, Deputy Director and Chief Curator of M+ from Hong Kong; Gregor Muir, International Acquisition Director, and Clara Kim, the Daskalopoulos Senior Curator at Tate Modern in London; Yung Ma, Curator at the Centre Pompidou in Paris, to name but a few, greeted friends throughout the fair. Those who had come a long way, such as representatives of MOMA, seized their chance and visited artists who were not even showing in the fair or the local gallery spaces at the time. They also visited the Taipei Biennial and local galleries. 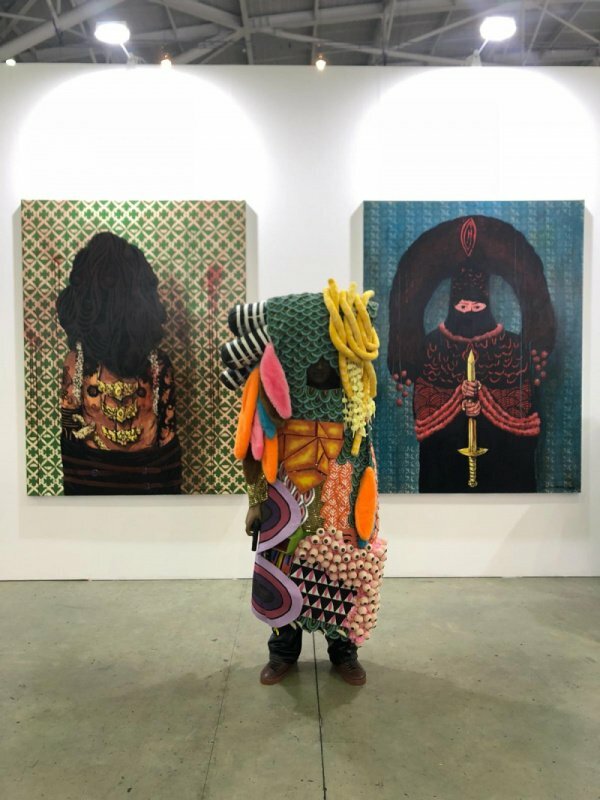 The fair was expertly organized and presented very sleekly under the leadership of Magnus Renfrew, the founding director of Art Hong Kong, which was later rebranded as Art Basel in Hong Kong. Renfrew’s idea of making Taipei Dangdai a relatively small but high-quality fair has proven to be both brilliant and visionary. The 90 galleries that set up booths included international giants, like David Zwirner, Hauser & Wirth, White Cube, Gagosian and Pace Gallery. Smaller galleries that are still top-tier, such as Esther Schipper and Galleria Continua, and young galleries, like ROH Projects and Amanda Wei, as well as 18 galleries founded in Taiwan, created a good mix of established and emerging artists. It is always a challenge for the galleries to strike a balance between sales and looking spectacular when they plan their presentations, especially for a first edition fair like Taipei Dangdai. A few galleries underestimated how strong the overall presentation would be and so paled in comparison to their peers, even though they were capable of doing better. Showing big names and great works is not so much about the mega-galleries, but more about bringing appealing and interesting works to the market at the right price range. Against the backdrop of global economic uncertainty, exhibitors tended to be more conservative, as was expected, with only a handful of really challenging pieces on show, such as Mona Hatoum’s installation set Remains of the Day brought by White Cube. Hauser & Wirth was also bold in dedicating their entire large booth to the late German artist Günther Förg. The overall presentation may have been less challenging but it was indeed of the highest quality, reflecting the importance that the exhibitors placed on it. Located right at the entrance of the fair, Kukje Gallery welcomed visitors with a solo booth of Haegue Yang. This was the first solo show the gallery had ever presented at an art fair. 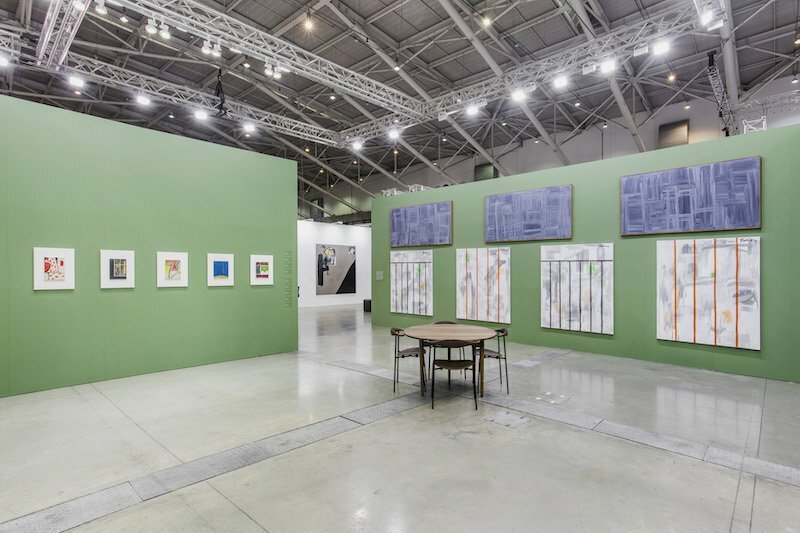 Resembling a fully-fledged exhibition, the booth featured a panoramic wallpaper piece against which Yang’s iconic series The Intermediates were displayed with two-dimensional works, sculpture, and sound elements. Berlin’s neugerriemschneider presented a beautiful booth based on the idea of time, from the swirl of the wind to the cycles of celestial bodies. It included works by Olafur Eliasson, Pae White, Tobias Rehberger, Ai Weiwei, Elizabeth Peyton and others. Three pieces by Olafur Eliasson were sold during the preview, creating much anticipation among local collectors. Lehmann Maupin also brought along a group show of its roster of international artists, including Do Ho Suh and Lee Bul, which showed the gallery’s deep Asian roots, along with Heidi Bucher, Angel Otero, McArthur Binion, and others. Angel Otero’s large painting was sold on the third day and replaced with a work by David Salle. Do Ho Suh’s Refrigerator, Unit 2, 348 West 22nd Street, New York was also sold, allowing the gallery to show a large hanging sculpture by Lee Bul. Gallery Director Shasha Tittmann was happy to see old and new friends, not only from Taiwan, but also around the region, even New York. She believed that the communications would go beyond the period of the fair and bear fruit in the future. Talking about sales, the galleries had been well-informed about the slower pace of purchasing here. Major sales nevertheless were made on the first day, including a cast iron sculpture by Antony Gormley, a large-scale painting by Georg Baselitz, a beautiful vitrine by Anselm Kiefer at White Cube’s booth; four paintings by Günther Förg at Hauser & Wirth; and the major piece at David Zwirner’s booth, Infinity Net by Yayoi Kusama. The sales continued steadily until the last day of the fair. Thaddaeus Ropac found a new home in Taiwan for Georg Baselitz’s €2 million painting Der Bote (The Messenger), and Lisson Gallery also sold works by Julian Opie and Anish Kapoor, among others. The presence of artists from Taiwan was strong, shown not only by local galleries, but also those based in other places. A few artists’ work appeared in more than one booth, such as Chou Yu-Cheng (周育正) presented by Edouard Malingue Gallery, Project Fulfill, and TKG+. Galerie du Monde’s solo booth and an off-site exhibition by Wu Chi-Tsung (吳季璁) were both sold out during the fair. Mind Set Art Center had to replace its walls with paintings by Tang Jo-Hung (黨若洪) several times, while Each Modern reinstalled the booth with a roster of artists, including the rising star Lin YiHsuan (林亦軒). Paintings by the late recluse Yeh Shih-Chiang (葉世強), presented by Hanart TZ Gallery, were also very well received. Video works were relatively rare in the fair, which was dominated by paintings and sculpture, but they still sold well. 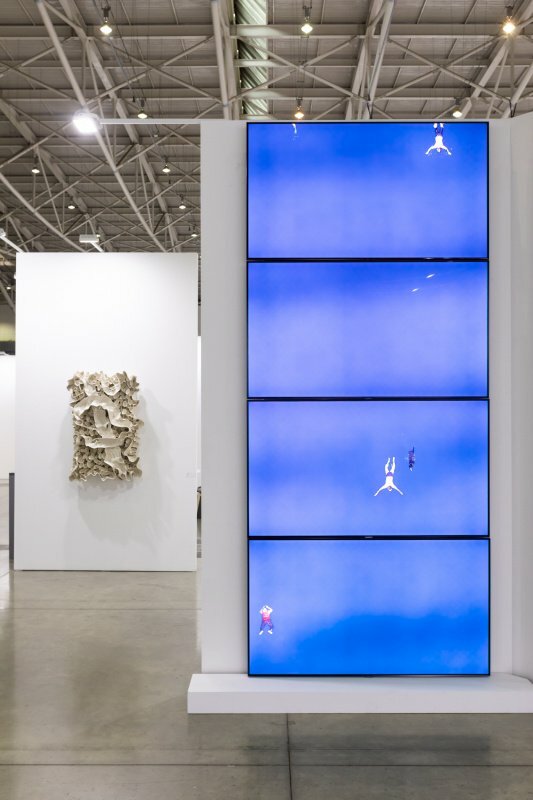 Liang Gallery presented a solo booth of Hsu Chia-Wei (許家維) and confirmed 4 sales of video work before the fair had ended. All five editions of Deep Royal Blue by Chen Wan-Jen (陳萬仁) were sold during the fair to local and overseas collectors by Double Square. Martha Atienza’s Our Islands 11°17’19.6″N 123°43’12.5″E and Migration N 49°57’04.39” W 033°08’05.15”, which was brought by Silverlens, went to a local collector and a member of the Tate acquisition committee respectively. Despite the fair lacking any sales of an astonishingly high price, the majority of exhibitors were happy with the results, which were considered to be healthy. Nevertheless, any “small flaws cannot obscure the splendor of a jade” as people here would say. The first edition of Taipei Dangdai has earned much acclaim and the local art scene is definitely looking forward to the second edition next January. Quite a few galleries based in other places, such as David Zwirner, Sprüth Magers, Mothers Tankstation, and Silverlens, are also positive about coming back. Isabelle Kuo is trained in Biochemistry but later went astray into the fascinating field of Art History, Isabelle was a senior editor of Art Investment and is now working for Mind Set Art Center.